Downtube Mini? Other 16” folder under $500? Folding Bikes Discuss the unique features and issues of folding bikes. Also a great place to learn what folding bike will work best for your needs. I’ve seen a few articles, but can’t find too much recent information on the Downtube Mini (not MiniB). 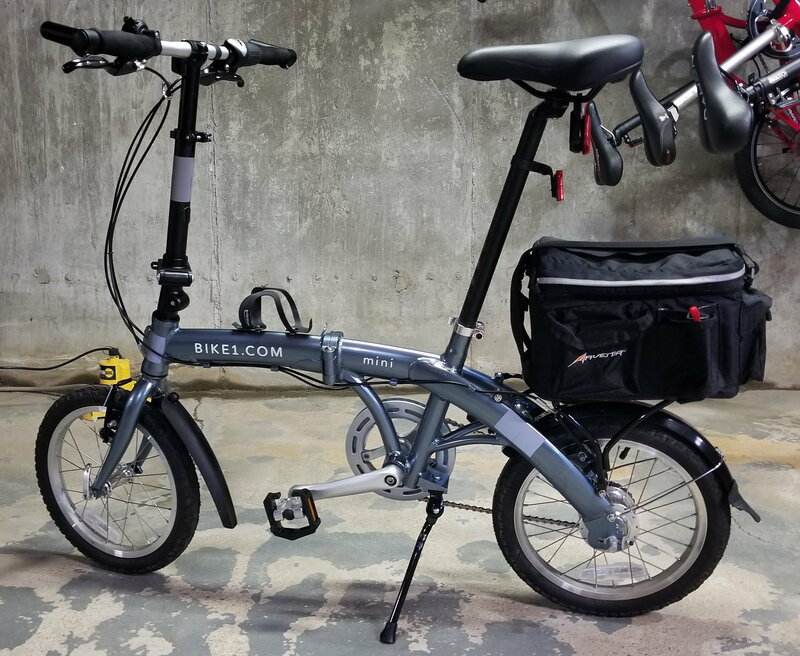 I’m considering a 16” folding bike and it seems great, but does anyone have any recent hands-on experience with it? Would you recommend it? Is it as easy to pack away as it seems? Is it good for light off-road aventures with it’s 16” wheels (I know people have done it)? Has it needed much maintenance? Would you recommend another bike? I’m 5’2” and about 120lbs. Other than reputation, I don't know the Mini but I personally don't find 16" wheels suitable for anything remotely off-road. I love my Bike Friday pakiT but the low wheels also means lower clearance. Maybe some very hard packed dirt might be okay but anything with ruts, rocks, or other obstructions would not be good. And sand or gravel is just unpleasant. Just my opinion. Tiny folders are great for multi modal riding and packing, but if you want to go off-road I would suggest at least a 20" wheel. The are other similarly priced 16" folding bikes. You can check out Dahon, Origami, Citizen, and a host of others. Are any of those bikes going to be better than the Downtube, probably not... except from a rider personal preference standpoint. Unfortunately, apart from Dahon, it isn't very easy to test ride most of these bikes. I should note, however, that for the most part these bikes aren't meant for off-road. If you only mean a relatively flat packed earth path, then sure. But if you're going to be going over tree roots and other minor obstacles, this may not be the best option. If you like the look and specs on the Downtube Mini, I would reach out to them about the return policy to see if you can get the bike, try it out and see if it fits your needs. The owner of the company is a poster here on the forums, so he may even see your questions and respond here. The fold is a PITA, as it doesn't have a way to keep it securely closed when folded. And even if it did, the handlebars don't sit well between the frame. I'm using clear gorilla tape to prevent scratches and such. 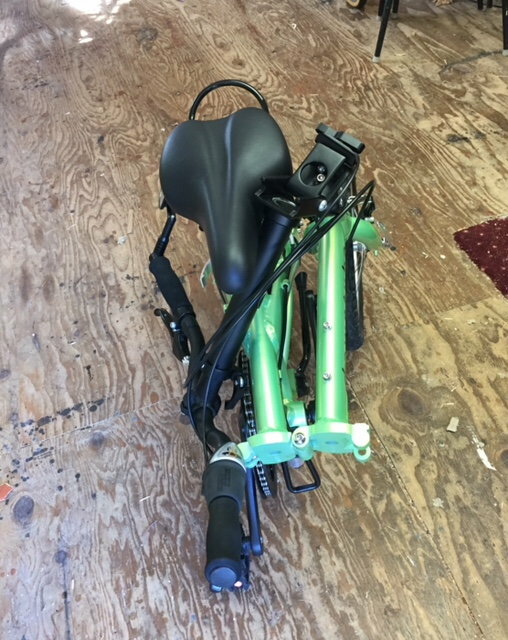 I swapped out the handlebars, and it folds a bit better,...still not optimal. The pedals are throwaways, so you'll need a new set asap. It doesn't come with a front fender, only a rear. Regardless of what DT says, a front fender keeps mud, dirt, rain off of you,...it's necessary. The rear rack is another MAJORLY annoying thing. I can't use a trunk bag with it, as my heels hit the bag. It might work for a person w/smaller feet. For myself, and my kids,...no good. I'll need to replace it with something that sits higher. Now, I own quite a few bikes,...so I'm used to certain things. It's a good bike, and the $399 price is actually a steal. I'd still buy it,... I'm slowly making changes to it. The fold will always be MEH,...but it's doable. The OP asked about light off-road, and at 5'2" & 120lbs, this bike will do just fine. The frame is decently strong. I'm 230lbs, and I'm quite comfortable riding it. Jur, who's a longstanding member here, did MAJOR rides on his Downtube Mini. I think, even with my admission that this bike isn't perfect, it's worth purchasing. I'm just annoyed that I need to do parts swaps to get it up to snuff,...but at this price, I should have expected that. I agree with tds191, particularly on the fold. Mine came with a defective handlebar stem. I'm planning on upgrading the stem to one that allows the handlebar to rotate , my cost to replace it is not much more that having it repaired. I'm hoping this helps with folding. As to using this bicycle off road, I don't think I would. A 20" wheel would better. The Mini would certainly be a good fit for the OP at 5'2". If, and when, you find an alternative to the handlebar stem, could you please send me a link to where you're purchasing it from. I'd replace this one for either a rotating stem, or a stem that folds to the outside of the fold. Either way, we'll still need Velcro to keep the bike folded for carrying. As to off road, it can be done on light trails and such. @jur did full on touring on his I believe. I'm not suggesting crazy mountain biking, but ral trails, dirt paths, etc. The DT Mini will be just fine. Bikes: Pacific Cycles GT, Downtube Mini 2015 version, LitePro Crius 14"
I use a rear rack that connects to the seat post to avoid any kicking issues. But, the fold is not as small now, because I can no longer drop the seat post to the bottom. All that being said, I usually sport a backpack anyway (a Tom Bihn Smart Alec, which was made for cyclists). I added a front fender like tds101, I swapped out the pedals, brakes, and tires; all over time. I've had the bike for a few years. Thank you all for this great information! 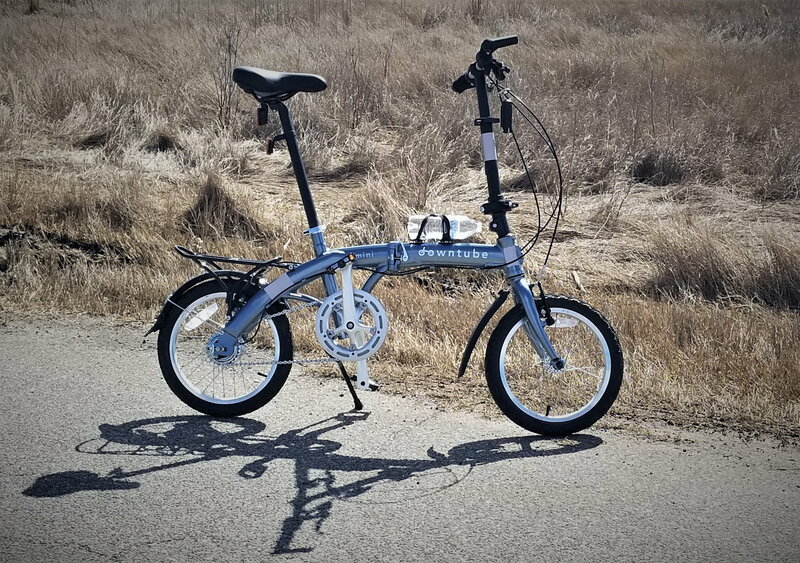 It really is hard to find folding bikes to inspect and bring out for a test ride, so this discussion has been very helpful. I have a feeling I'll be sticking with the 20" as my first bike, but I'm going to keep the mini in mind for the future and I'm glad I now have some more practical information! It does seem like a great deal for the price. The EEZZ D3 is certainly intriguing and another bike on my 16" list, but it's definitely pricier than the Mini. The handlebar stem can be folded to the outside or over the top as seen here. Put the front wheel quick release to the drive side of the bike, things fit better. I have the brake levers pointing up in this photo. Nope,..that's definitely not a folding option for me. With my 20" Downtube, I currently use the rack it came with because it's sturdy and enables a cleaner fold, but I've also used a Topeak, quick-release, seat post rack. It does prevent the seat post from dropping all the way when attached, but it can be easily removed. 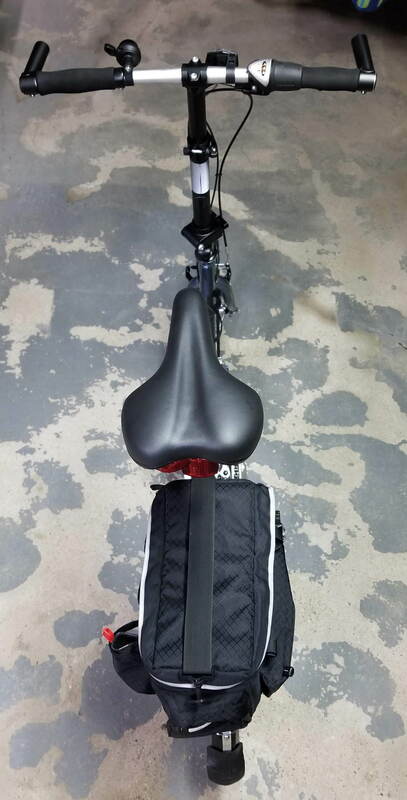 It also has optional side-panels that make it pannier-friendly, which is nice, although that also makes the rack bulkier if you're looking to squeeze everything into a tight space. But between that rack and the front, Downtube bag, I feel like I could fit a fair amount of luggage on that bike, and I imagine the same could be done for the 16"
It's not That old! Maybe it's time to start a making the most of your Mini thread. Always post a picture of your mods.